Tru-lux is always the best light to view yourself in, but sometimes you may want to see what your makeup will look like in other lighting scenarios like candlelight or if it’s overcast outside. Capable of over 50,000 color variations, choose presets or use the simplehuman phone app to capture light settings from the environment around you and recreate them on the mirror. That way you can check your look in the office, your gym, your favorite restaurant — anywhere you want to look your best. No guesswork and no surprises! The 1x magnification main mirror is great for an overall view while the 10x magnification detail mirror magnetically attaches to the mirror for an extremely close-up view for detail work like tweezing and applying eye makeup. Our wide-view sensor mirror has a flat, wide viewing area so you can see your entire face at once. Its side panels also fold in so you can view and check your look from almost any angle to ensure your makeup is precisely and evenly applied. Our wide-view sensor mirror is wifi-enabled, which allows you to use the simplehuman app to access the mirror’s smart features, like Alexa. For instance, you can tell Alexa to make the mirror's light brighter. Or you can manage your time efficiently by using the mirror’s soft-alarm feature – it flashes the lights to keep you on schedule. TRU-LUX LIGHT SYSTEM - Simulates natural sunlight allowing you to see subtle variations in your makeup color so you'll always know when your makeup is color-correct and flawless. ACCESS SMART FEATURES WITH SIMPLEHUMAN APP - Use app to choose presets or capture light settings from the environment around you and recreate them on the mirror plus other features. 1x MAGNIFICATION + 10x DETAIL MIRROR - 1x wide-view mirror for an overall view; 10x detail mirror for close-up work like tweezing and applying eye makeup. SENSOR ON/OFF - Automatically lights up as your face approaches, then turns off after you walk away. 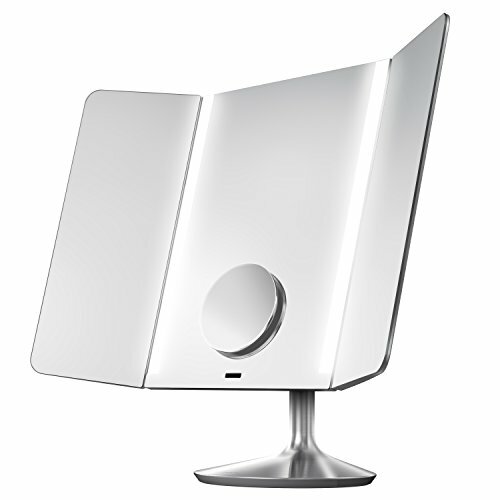 WIFI CAPABILITY - Allows you to access the mirror's smart features. RECHARGEABLE AND CORDLESS - Can be used without a cord for up to 5 weeks on a single charge. SURGICAL GRADE LEDs - Will perform like new after 40,000 hours - that's an hour a day, every day, for more than 100 years.